Boca Marina Yacht Club is an established waterfront community in Boca Raton, Florida located on Federal Highway (US 1) North of Spanish River Blvd. on the West side of the Intracoastal Waterway. 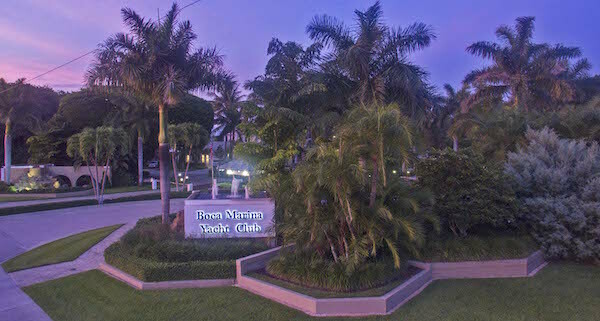 Boca Marina Yacht Club began in the 1980's as one of the area's premier waterfront communities. This desirable location is still sought after today. Boca Marina is comprised of subdivisions to enjoy the yachting lifestyle. Each home has a dock slip and additional guest dockage is available. Boca Marina also has a 24 hour/7 Day per Week Manned Gate House. The beautiful clubhouse at Boca Marina Yacht Club with a sparkling pool and tennis courts offer more of the Florida lifestyle activities everyone wants. Boca Marina Yacht Club is a wonder place to live if you are seeking a waterfront community with great amenities. For a private tour of Boca Marina Yacht Club and other Boca Raton Luxury Home Communities, please contact us at Mizner Grande Realty. We specialize in South Florida's finest properties.